Finally, I realize that we have blundered into a psychedelic playground, a phantasmagorical graveyard, a portal into the mind of Walt Disney if he had finally gone insane. We are inside an enormous pinball machine; we are floating in a kaleidoscope, twirling on the blade of a pinwheel, teetering on the brink of ruin. Arcade sounds and blinking lights crash into each other like a splendiferous car wreck. It is impossible to determine where any of these noises are coming from particularly – they are omnipotent: The sound of supreme lunacy. The iridescent wallpaper and garishly patterned carpet shimmer like a lenticular nightmare; the entire room moves involuntarily. For a moment, I have to focus on a single object, lest my brain get sucked into this vast vacuum of sheer carnival bedlam. I concentrate on the blinking sign above a slot machine: Wheel of Fortune. Wheel. Of. Fortune. I am captivated and horrified simultaneously. People, all of them ostensible zombies, wander aimlessly through this anarchy, overwhelmed by the artificial brilliance. Kristen points out the ease with which some of them drop tokens into slot machines – sometimes playing two machines at once – tokens that represent one dollar, five dollars, on and on. 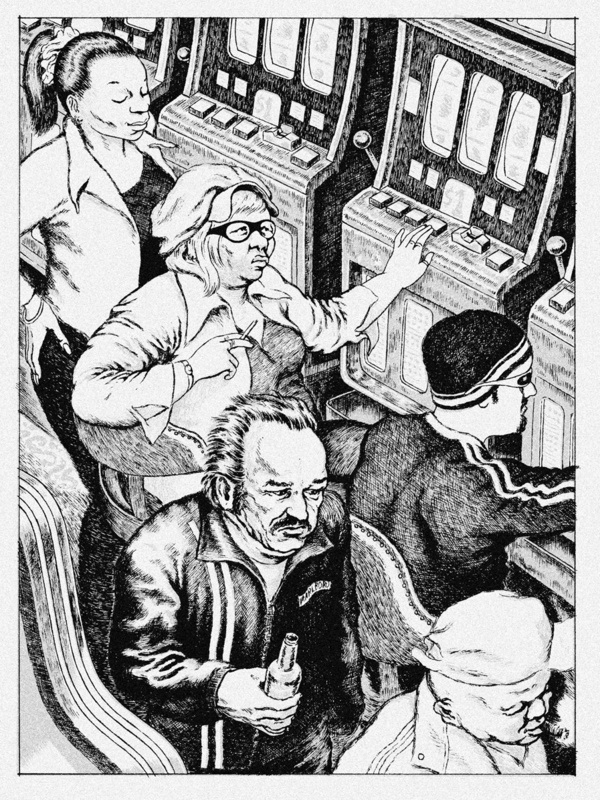 Indeed, it’s true: They pull the slot machine arms and light long cigarettes with an implacable, hypnotic method. They dump their savings into twinkling boxes with spinning devices. And how effortless they make the procedure look, like breathing or wiping their noses. Going for broke takes no effort at all. I try to connect the implications of all this madness, shape something useful out of these abstractions, when I’m tackled by another delirious distraction; there is always something near to snap you out of the horror of a clear thought and plunge you pell-mell back into the dreamy nonsense of ordinary events.